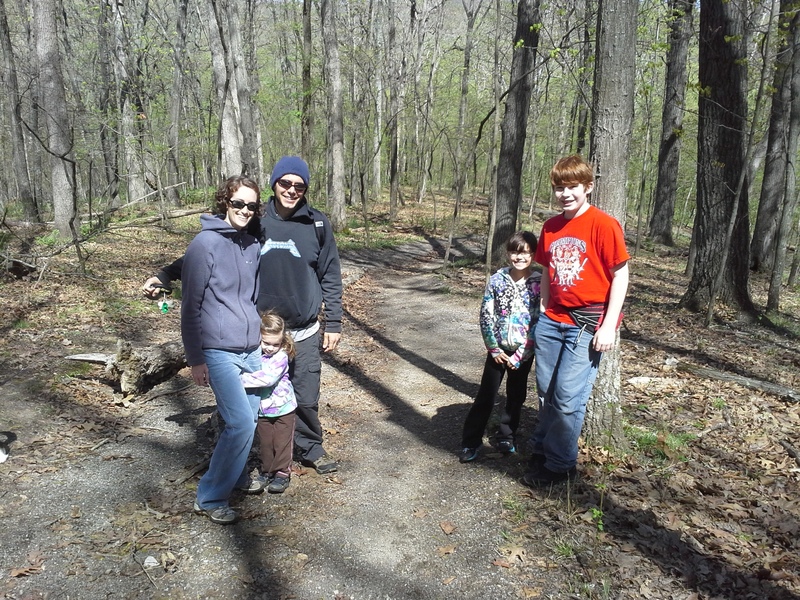 Beth, Josie, Paul, Mak, and my son Eli. It was one of those mornings that was really working hard to be warm. 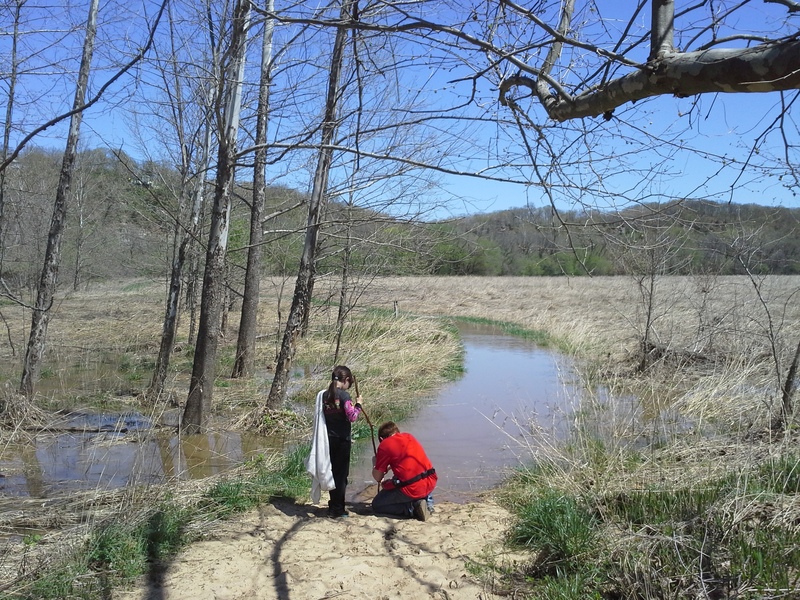 I wanted to get out in the woods with my son Eli and Max (the hiking dog), and my friends Paul and Beth and their girls, and I had my heart set on checking out the Castlewood Loop, just off of the Chubb Trail. We got to the trailhead, up the hill off of 44 right past the entrances to the World Bird Sanctuary and Lone Elk Park at about 11:00 am, and the sun was high in the sky trying to convince the chilly air and the light breeze that it ought to be a warm day. 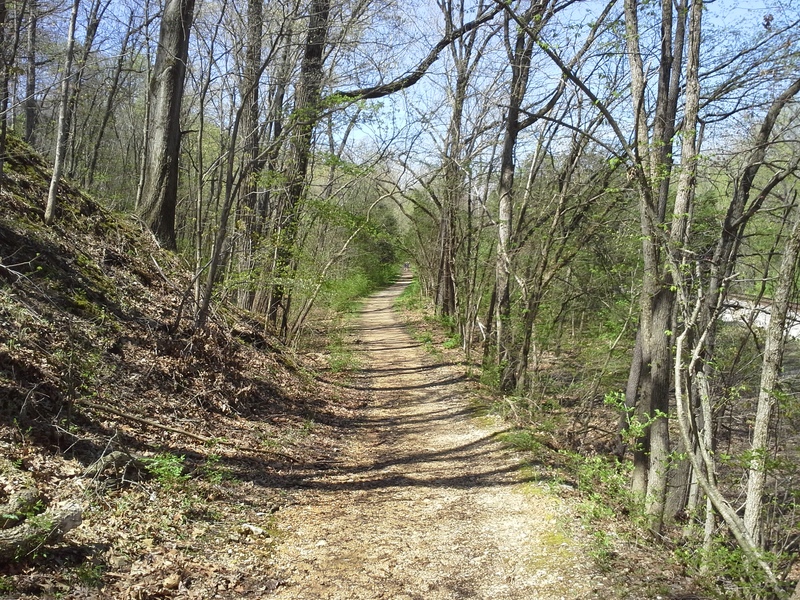 The Chubb Trail is a 7 mile trail that runs from West Tyson County Park out toward the Meramec River, and then turns east and moves through the flood plains and then up a hill to Lone Elk County Park. Adjacent to the Chubb are a couple of other trails along the way, and today we were going to hike the almost 3 mile Castlewood Loop, flood water permitting. From the Lone Elk trailhead, it’s about a mile and a half to the Castlewood Loop. You follow the ridge road just a bit before the trail veers off and down to the left, and you make your way on a pretty healthy incline down to the flatlands at the base of the surrounding hills. At the bottom you follow what was at the time a moist and splashing flat run, parallel with the railroad tracks for quite a ways, until you eventually turn right and cross them. Soon after the crossing, the Chubb continues to the left and on to West Tyson, and the Castlewood Loop is either straight or right, depending on your choice of direction. 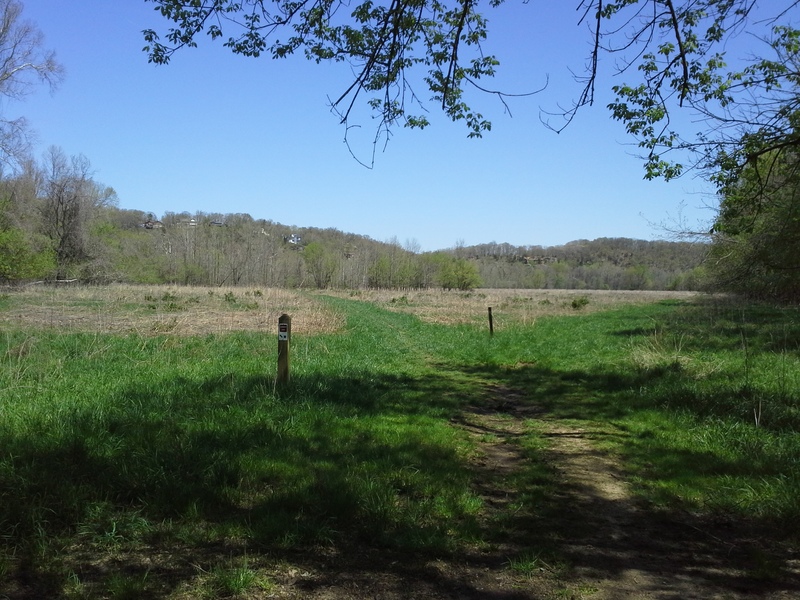 Once you get onto the Castlewood Loop, the trail takes on the look of the floodplain. Swampy, open brush areas littered with washed up logs and scattered piles of swept-in sticks. 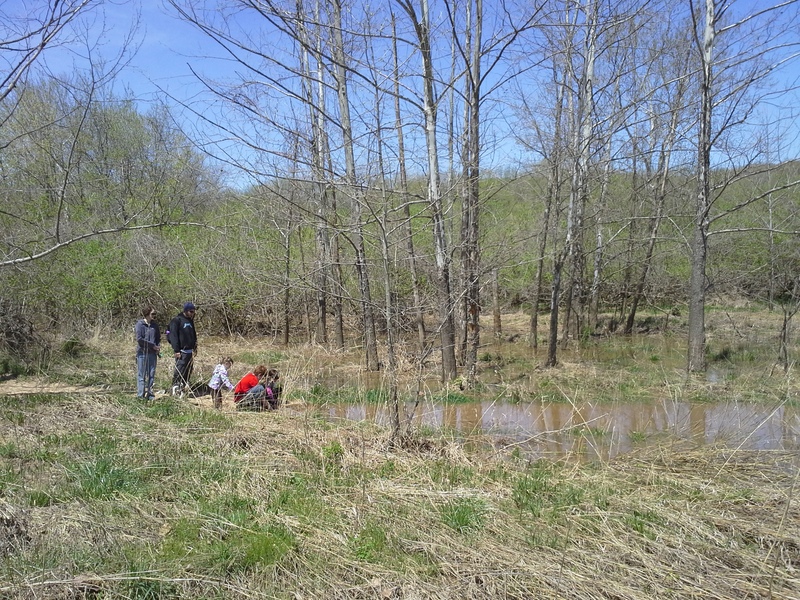 The forest floor was a vibrant green though, with the spring grasses fighting for dominance in the rich, muddy soil. It then opens up to a wide prairie area, with a treeline obscuring the river up ahead, just below the bluffs on the other side. 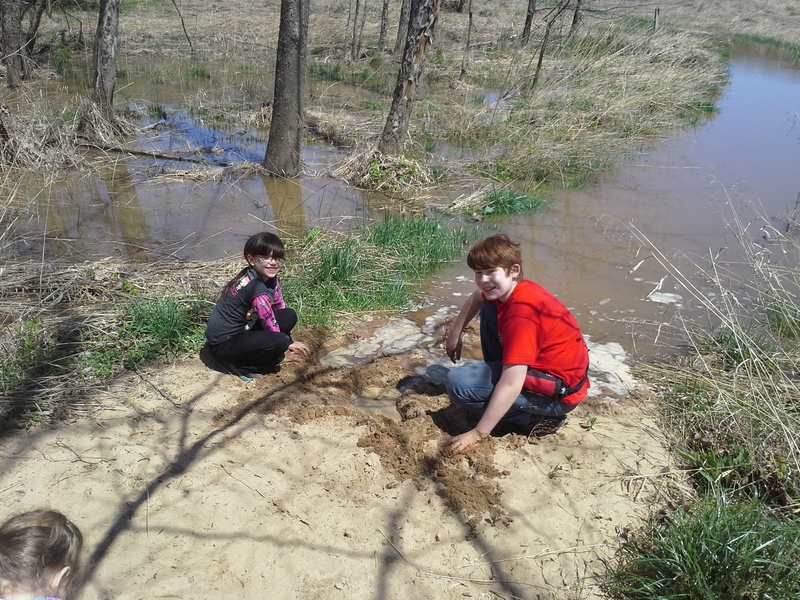 The muddy soil turns to sand eventually, and it was soon after this point that out path was blocked by the subtle and immense overrun of the Meramec River. Looks like this was the end of the road. So we stopped for a bit and appreciated the power of the weather and rivers to change the course of things, and pondered the lives of the people who live in the mansions up on the bluffs on the other side. The Meramec, like all decent sized rivers, has a wide reach when given the opportunity. I like to practice the belief that the width of flood plains and river valleys across the landscape is a clear sign that it is the river that truly owns the land, and bends it to it’s will. We had our snack, after probably 2 miles from where we started, and then turned around and made our way back into the woods and up the trail the way we came. On our way back, after crossing the train tracks, we saw two groups of deer at different points bound across the trail and into the woods on the Lone Elk side, the final little deer standing for a second in the trail about 50 yards ahead of us, taunting Max with his gaze and fluttering little tail. I would have loved to catch some pictures, but you can’t stage fleeting encounters like that. We got to the base of the hill and made our way up it with fairly little complaining, regardless of the steepness, and got back to the car a little after 1:00. The air had warmed and though we didn’t get to complete the loop, it was a good four miles of quality time spent in the woods with some good people. I am looking forward to hiking this again once the waters recede. It looks like a very nice hike, hope that you get a chance to go back after the flood recedes. I’m planning on it, once the water is gone and rain dilutes some of the inevitable river mud. I also need to hike the Chubb Trail from start to finish sometime. I’ve only done parts of it.